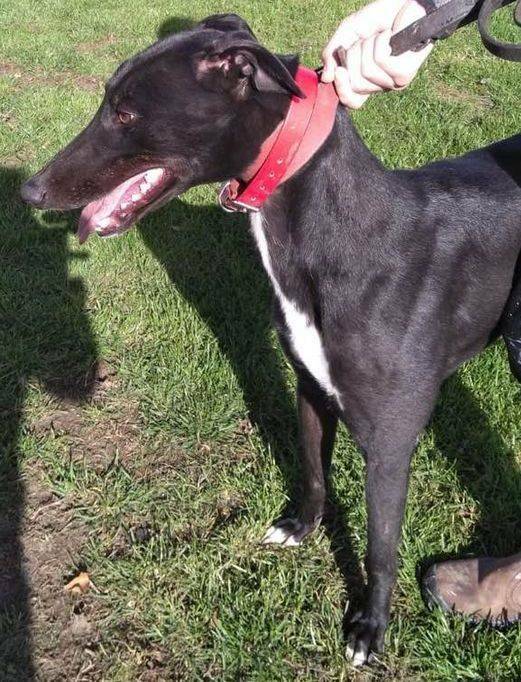 Hello everyone, this is Daire (pronounced Dara) and I'm just another unwanted black ex racing greyhound from Ireland. Luckily for me, I've found my way into the ownership of Bristol DAWG and I am assured they'll find me a lovely home as a pet. I'm quite a big lad, not in bad condition and I walk pretty well on my lead. I'm told that us black dogs aren't very popular as pets, but please don't be put off by my colour, rather judge me by my personality. Anyway, apparently Hilly says that there's nothing more stunning than a beautiful black dog with a lovely shiny coat - that describes me to a t! I absolutely love human company but, unfortunately, I can't be considered for a home with cats. If you're looking to share your life with a dashing handsome young devil like myself, please get in touch to arrange an appointment to meet me - you'll be the envy of all your friends! As we have only limited history on most of our dogs, we usually only rehome with children eight years and over. Dogs are only ever released to homes which have direct access to securely fenced gardens.